Beth, great website, I often forward it to my daughter-in-law so she can see what I have up here…competing with Keepsake Quilting, where she live? She envies me. Your line-up of classes are wonderful. Just finished my beginning quilter’s class and enjoyed it immensely. Too close to Christmas for attending more for me…I have my time pretty well booked until after the holidays. Looking forward to having the time to attend some more! Ladies, keep up the great work! 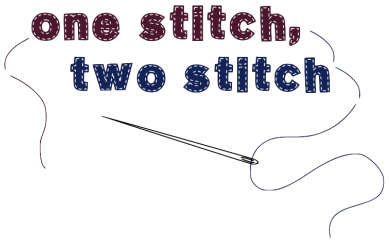 -Stephanie M.
One Stitch Two Stitch is my second home. I travel 75 minutes one way to get there and it’s worth every minute and mile. Great classes, wonderful staff and teachers,beautiful fabric selections and 100′s of patterns to choose from. That’s not all you get tea also!!! -Cheryle S.
Took a class this summer, excellent class and teacher (Louise), very eye opening on how much I have to learn. Will be back for more after the first of the year to learn much, much more. Need more classes for beginners like me. - Cecile S.
Fabulous possibilities!! - Marge L.
I love reading your newsy newsletters, Beth, and dreaming of all the wonderful projects that you’ve selected! - Eileen A.